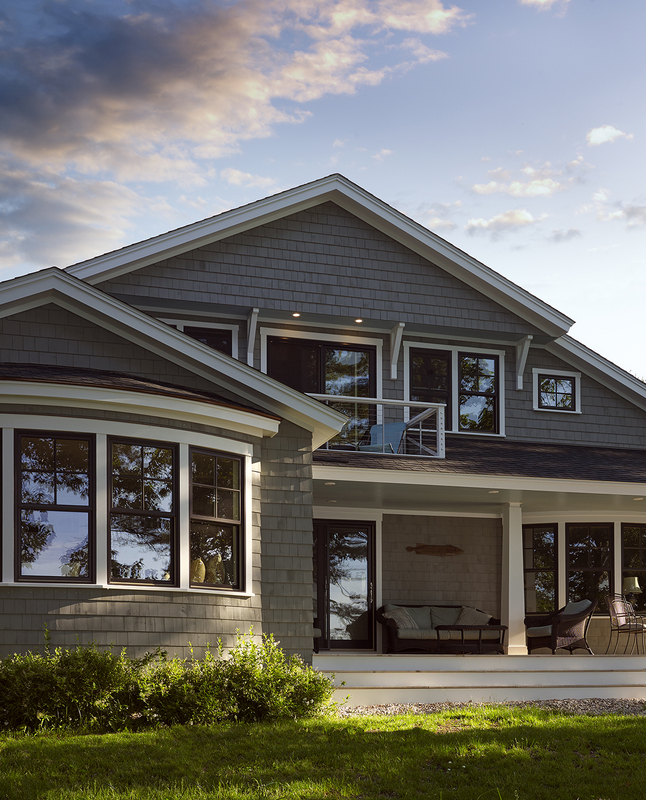 Structural changes and architecture were addressed by Whitten Architects, of Portland, Maine, which laid the foundation for bringing the home into the 21st century. Major architectural changes include the addition of a second floor master suite, as well as the absorption of an existing screened porch into the home. 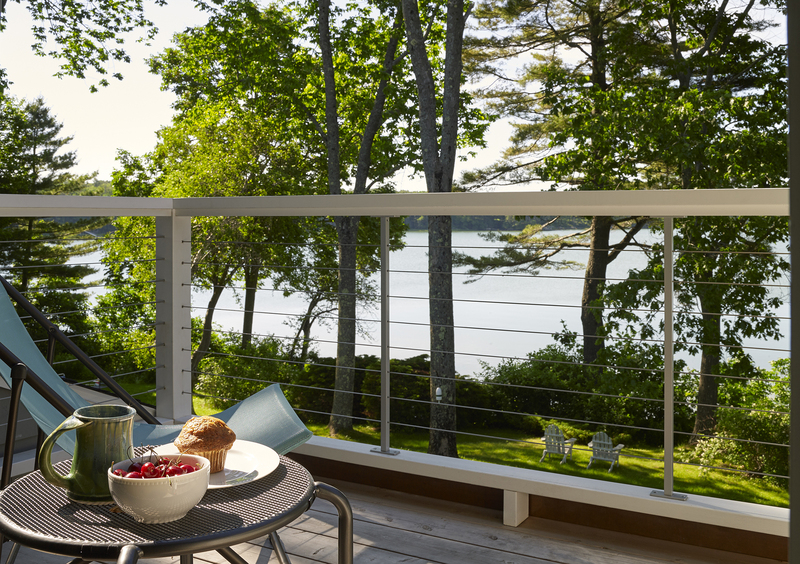 The decks and porches were updated and expanded. Additionally, almost all of the interior partitions in the heart of the home were removed to create an open concept living space. Today, as you approach the dramatically transformed shingle-style home, there is no hint of the 1960s ranch that once was. 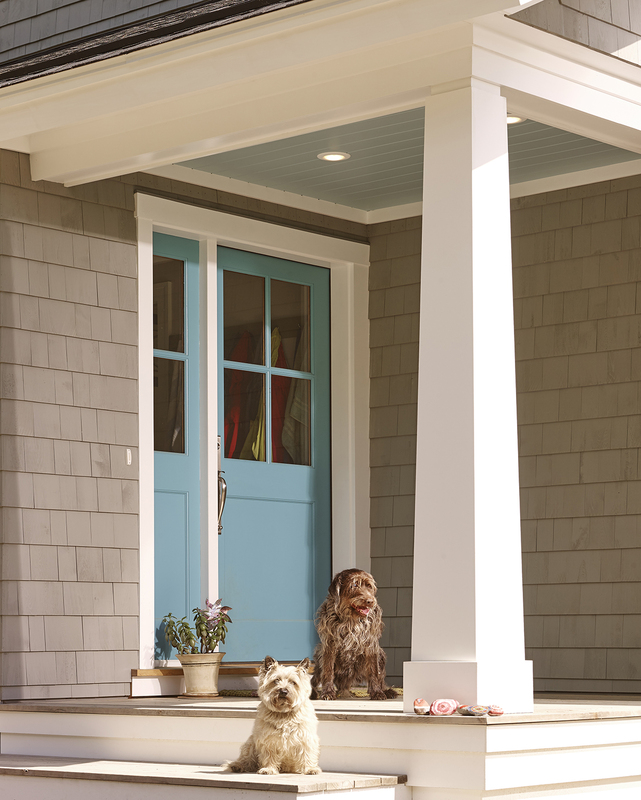 The bright blue door is a welcoming greeting and the simple tapered columns emphasize the home’s understated coastal charm. Our clients had a dream of raising their growing family of five directly on the ocean. Searching through the small coastal towns outside of Portland, they came upon the perfect property but did not love the basic 1960’s ranch that came with it. The house had sat largely untouched for almost 30 years, and the homeowners were determined to make it their own. For the interior and exterior finish selections, the homeowners engaged Knickerbocker Group, who envisioned the home as an eclectic blend of modern and antique aesthetics. 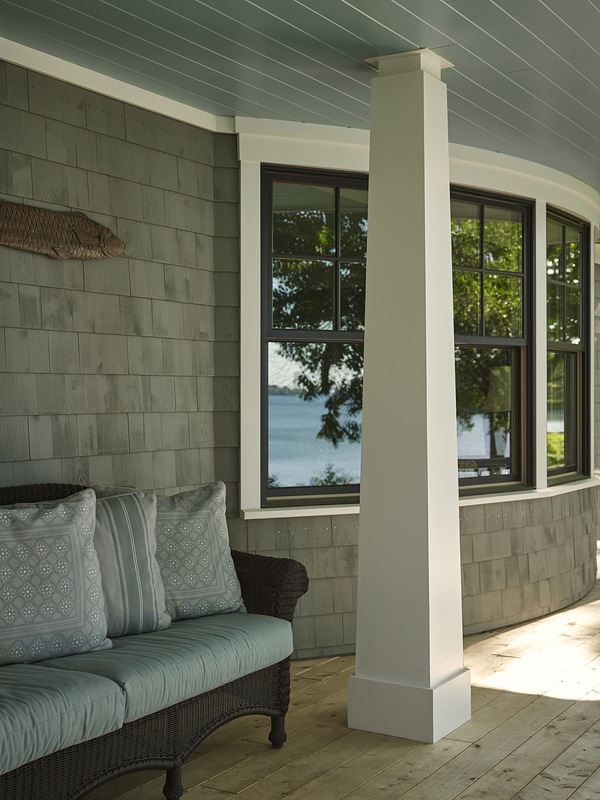 A new bay of windows, inspired by the sweeping ocean views, provides ample seating for entertaining and unifies the living space. The elegantly curved window seat is outfitted with soft cushions and pillows in a variety of fabric patterns selected by the homeowner, which draw from the cool blue and warm red palette of the antique Oriental rug nearby. The ceiling design, with its unique and distinctive crosshatch pattern, adds interest and serves to define the space. The ultra-suede chairs and tapestry covered banquette reflect the palette of the nearby living space, and mirror the vibrant colors of the original art work. The pendants from the kitchen island are introduced over the dining table, but re-envisioned as a cluster installation. 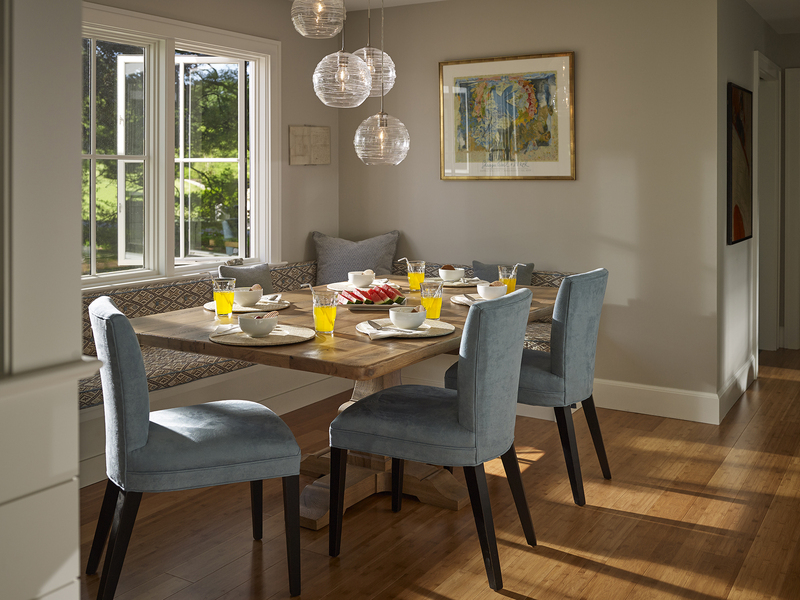 The modern globe fixture is juxtaposed against the traditional feel of the farmhouse style dining table. Thick slabs of cherry, similar to the bar top, wrap the parged structure to create a mantle and additional shelving space. 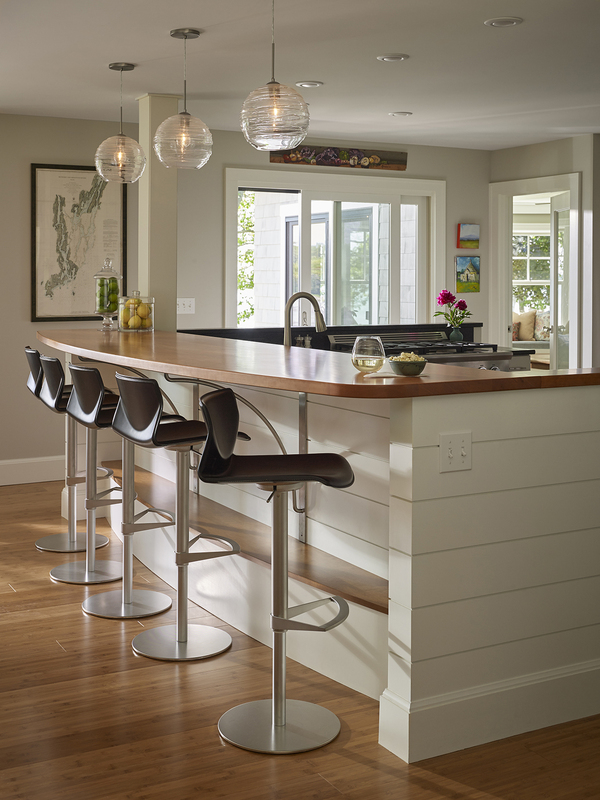 The kitchen features a custom L-shaped peninsula-style island with seating for 5 around a generously sized cherry bar top. In the newly opened floor plan, the kitchen becomes a striking gathering space, accentuated by the horizontal nickel-gap cladding, a bright turquoise glass backsplash, and the transparent glass globe hanging pendants. Built-in cabinetry behind the working island includes a deep walk-in pantry uniquely disguised behind custom doors set within the cabinetry. 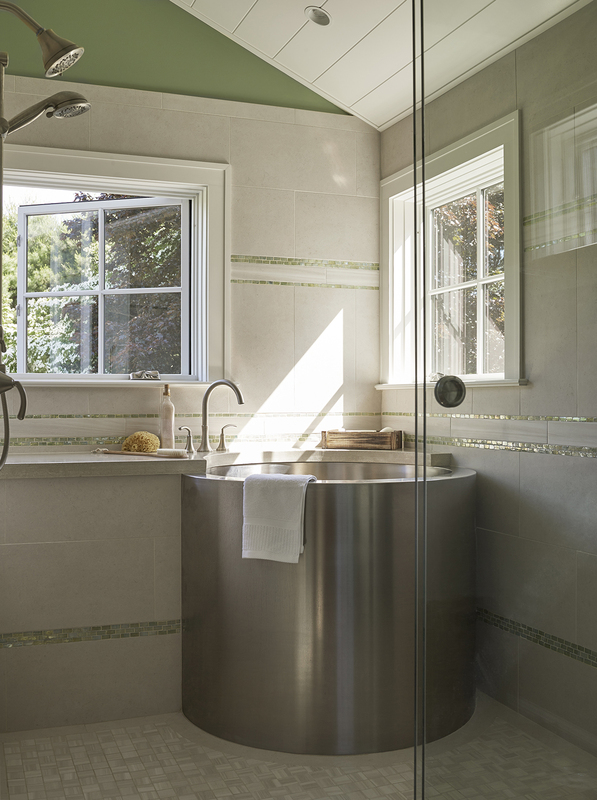 The star feature of the master bathroom is a Japanese soaking tub seamlessly integrated into the minimally framed glass and porcelain walk-in shower. The tall ceiling, calming color palette, and casement windows give the space a fresh and airy feeling. 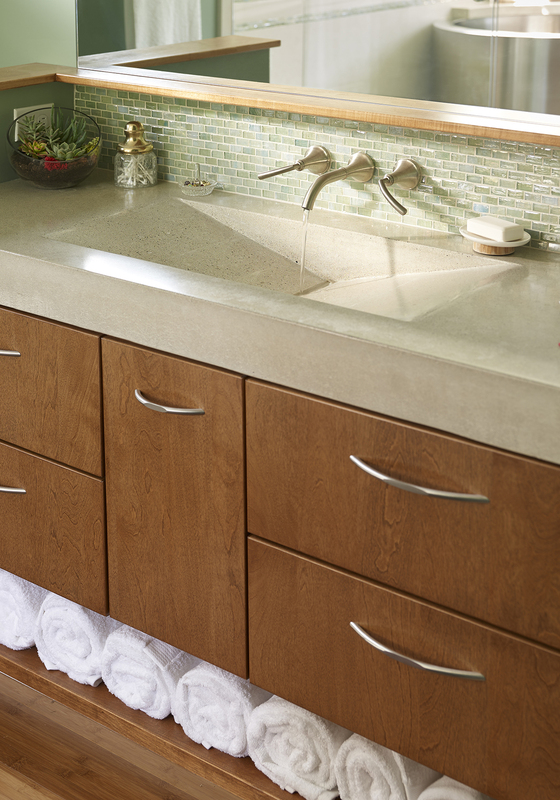 A custom polished concrete counter with integral trough sink and recycled glass backsplash add style and interest to the vanity. 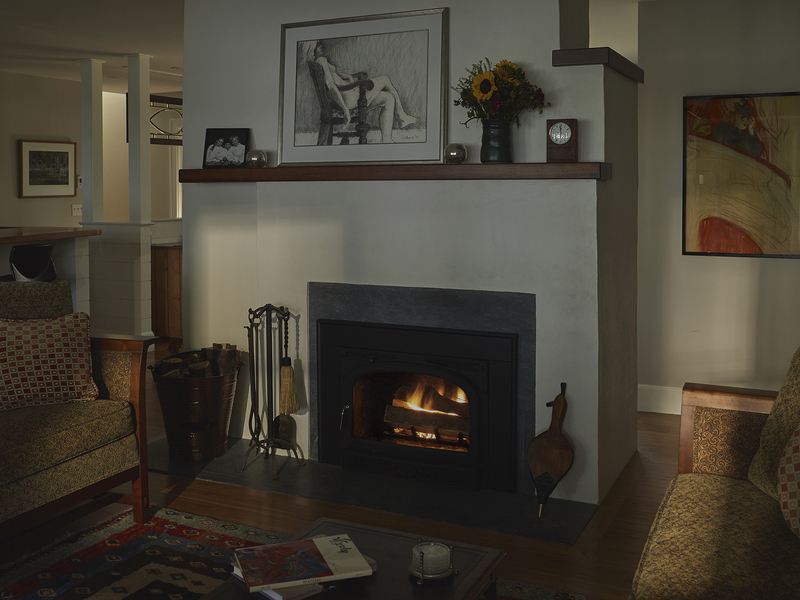 The parged center chimney fireplace is both a focal element in the living room and a room divider to distinguish the space from the unique and functional dining area just beyond.